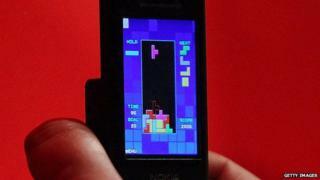 Tetris, the classic video game that involves slotting shaped blocks together, is to be turned into a movie. The game will provide the inspiration for an "epic sci-fi story", according to film company Threshold Entertainment. The company adapted the game Mortal Kombat into a movie in 1995. The simple but addictive Tetris is not an obvious choice for the big screen treatment - though that did not stop Lego spawning a movie this year. Threshold Entertainment chairman Larry Kasanoff, who will produce the film, said: "Everyone knows that Tetris is one of the best known, most beloved brands in the world. "What everyone doesn't know yet is this epic sci-fi story that we're going to tell. That's what's really exciting." Henk Rogers, managing director of The Tetris Company, said the film would "re-imagine that common experience and bring a spectacular new Tetris universe to the big screen". He added: "In this new universe, as you'll soon find out, there's much more to Tetris than simply clearing lines." Tetris was created by Alexey Pajitnov in 1984 and is now played online more than a billion times a year. The success of the Lego Movie helped boost the profits of the Lego company by 12% in the first half of this year.